Public concern with the incidence of antibiotic-resistant bacteria, particularly among foodborne pathogens has been challenging the poultry industry to find alternative means of control. Chitosan is a modified, natural biopolymer derived by deacetylation of chitin. The antimicrobial activity and film-forming property of chitosan makes it a potential source of food preservative or coating material of natural origin for improvement of quality and shelf life of various foods of agriculture, poultry, beef and seafood origin. 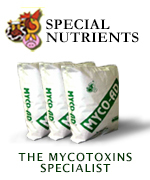 In addition to its use as an antimicrobial, it has been shown that it has good properties as a mycotoxin adsorbent. The purposes of the present chapter is to summarize our experience using chitin-chitosan from Deacetylated 95% food grade chitosan (Paragon Specialty Products LLC Rainsville, AL) or Aspergillus oryzae meal (Fermacto®, PetAg Inc., Hampshire IL) to control foodborne pathogens, improve performance, biological sanitizer and mycotoxin binder in commercial poultry. Chitin (C8H13O5N)n) is a long-chain polymer of a N-acetylglucosamine (Figure 1(a)), a derivative of glucose, and is found in many places globally. It is the main component of the cell walls of fungi, the exoskeletons of arthropods such as crustaceans (e.g., crabs, lobsters and shrimps) and insects, the radula of mollusks, and the beaks of cephalopods, including squid and octopi . In terms of structure, chitin may be compared to the polysaccharide cellulose and, in terms of function, to the protein keratin . Depending on its source, two types of chitin allomorphs can occur, the α and β forms, which can be differentiated by infrared and solid-state NMR spectroscopy together with X-ray diffraction . Chitosan is a high molecular weight polysaccharide linked by a β-1,4 glycoside and is composed of N-acetyl-glucosamine and glucosamine (Figure 1(b)). It is a natural biopolymer derived by deacetylation of chitin and the most widespread polycationic biopolymer . However, although chitosan is obtained from chitin, the applications of the latter compared to chitosan are limited because it is chemically inert  and because of its poor solubility . Unlike chitin, chitosan is soluble but in an acidic media since at neutral or alkaline pH it is insoluble. The properties of chitosan can be modified by changing the degree of deacetylation, pH and ionic strength. At neutral pH, most chitosan molecules will lose their charge and precipitate when it is in solution . The application of chitin is focused on obtaining soluble derivatives in aqueous media such as chitosan . Chitosan has several applications in fields such as waste and water treatment, agriculture, fabric and textiles, cosmetics, nutritional enhancement, and food processing. Given its low toxicity and allergenicity, and its biocompatibility, biodegradability and bioactivity, it is a very attractive substance for diverse applications in the pharmaceutical and medical fields, since it has been used for systemic and local delivery of drugs and vaccines . However, one of the most important application is its antimicrobial activity against bacteria, filamentous fungi and yeasts. Chitosan has wide spectrum of activity against Gram-positive and Gram-negative bacteria but it is more effective against Gram-negative bacteria [8, 9]. Furthermore, it has been reported that the antimicrobial activity and film-forming property of chitosan makes it a potential source of food preservative or coating material of natural origin for improvement of quality and shelf life of various foods of agriculture, poultry, beef and seafood origin [3, 10]. The mechanism of the antimicrobial activity of chitosan has not yet been fully elucidated, but several hypotheses have been proposed. The most feasible hypothesis is a change in cell permeability due to interactions between the positively charged chitosan molecules and the negatively charged microbial cell membranes [11, 12]. Other mechanisms include the interaction of diffused hydrolysis products with microbial DNA, which leads to the inhibition of mRNA and protein synthesis and chelation of metals, spore elements, and essential nutrients [5, 13]. The antimicrobial activity of chitosan depends on both intrinsic and extrinsic factors. Among the intrinsic factors are the molecular weight and degree of deacetylation of chitosan. While the extrinsic factors include pH, temperature and reactive time . Moreover, it has been observed that when the chitosan is in nanoparticle form, it has better antimicrobial properties since its small particle size gives it a greater surface area and high reactivity which could enhance the charge interaction with the bacterial surface and of this way to produce a superior antimicrobial effect . Salmonella enterica serovars continue to be among the most important foodborne pathogens worldwide due to the considerable human rates of illness reported, the wide hosts species that are colonized by members of this remarkable pathogen genus, which serve as vectors and reservoirs for spreading these agents to animal and human populations. Figure 2 shows the distribution of the major serotypes of Salmonella with importance in public health. Furthermore, the public concern for the appearance of resistant strains to many antibiotics, particularly among zoonotic pathogens such as common Salmonella isolates, is also challenging the poultry industry to find alternative means of control . For these reasons, continued research on sustainable alternatives to antibiotic growth promoters for animal production is needed. Interest in chitosan, a biodegradable, nontoxic, non-sensitizing, and biocompatible polymer isolated from shellfish, arises from the fact that chitosan is reported to exhibit numerous beneficial effects, including strong antimicrobial and antioxidant activities in foods . Its application in agriculture, horticulture, environmental science, industry, microbiology, and medicine are well reported. A significant interest in the antimicrobial activities of chitosan either as solution, or as powders, edible films and coating against foodborne pathogens, spoilage bacteria, and pathogenic viruses and fungi in several food categories has been extensively investigated . We have evaluated the effect in vitro and in vivo of chitosan on Salmonella typhimurium in broiler chickens . In our in vitro crop assay experiments (Table 1), 0.2% chitosan significantly reduced the cfu of ST at 30 min or 6 h compared with control (P < 0.05). In the in vivo experiments with 40 day-of-hatch broiler chicks and challenged with 2 × 105 cfu ST, dietary 0.2% chitosan significantly reduce the cfu/g of ST in the ceca in both experiments (Table 2). However, no significant reduction in the incidence of ST in cecal tonsils colonization was observed, suggest- ing that 0.2% chitosan significantly reduced the cfu of ST/gram in vitro and in vivo. Chickens contain large numbers of microorganisms in their gastrointestinal tract and on their feathers and feet; therefore, storage quality of fresh chicken is partially dependent on the bacteria present on the integument prior to slaughter. Pathogenic microorganisms present in chicken carcasses after processing and throughout scalding and picking can contaminate equipment and other carcasses . Pathogenic bacteria such as Salmonella spp. and Campylobacter spp. are able to attach to skin and penetrate in skin layers or feather follicles, facilitating their presence on chicken skin and carcass during poultry processing . Critical control point determination at broiler processing has become very important, especially because of the recent attention on Hazard Analysis and Critical Control Points (HACCP) for reduction of microbial contamination of meat and poultry . For all these reasons, strategies to reduce bacterial contamination on poultry carcasses are important. However, most of the bacterial reduction strategies for poultry comprise the use of antimicrobial chemicals in rinses or washes and their efficacy is reduced by the presence of organic matter. Therefore, it grows the need of biological sanitizers in the processing plant to prevent carcass to carcass cross-contamination by pathogenic bacteria and to lower the potential of foodborne diseases. Interest in chitosan, a biocompatible polymer derived from shellfish, as a biological sanitizer arises from reports showing several beneficial effects such as antimicrobial and antioxidative activities in foods . The use of chitosan in industry, agriculture, and medicine is well described . The antimicrobial activities of chitosan against foodborne pathogens have been broadly investigated in the food industry . Research conducted in our laboratory on the effect of chitosan as a biological sanitizer in chicken skin contaminated with Salmonella Typhimurium and aerobic Gram-negative spoilage bacteria present on chicken skin, have revealed that 0.5% chitosan for 30 s dipping ST contaminated skin samples in a solution of 0.5% chitosan reduced (P < 0.05) the recovery of ST by 24 h as well as the presence of spoilage-causing psychrotrophic bacteria below detectable levels , (Table 3). The antimicrobial activity and film-forming characteristic of chitosan makes it a potential source of food preservative, increasing quality and shelf life of different types of foods . The mechanism of the antimicrobial activity of chitosan has not yet been fully elucidated; nevertheless, different hypotheses have been proposed. The most realistic hypothesis is that chitosan is able to change cell permeability due to interactions between the positive charges of its molecules and the negative charges of the bacterial cell membranes . Other hypotheses include the chelation of metals and essential nutrients, inhibiting bacterial growth had also suggested that high molecular weight chitosan could be able to form a polymer membrane around the bacterial cell, preventing it from receiving nutrients . Prebiotics are non-digestible food ingredients that are selectively fermented by gut bacteria and are known to have positive effects on gastrointestinal (GI) physiology. Some prebiotics have been shown to selectively stimulate the growth of endogenous lactic acid bacteria in the gut thereby improving the health of the host . Prebiotics selectively modify the colonic microflora and can potentially influence gut metabolism . The commercially available mycelium product of Aspergillus oryzae, Fermacto® (PetAg Inc. Hampshire, IL 60140 USA), referred to as Aspergillus meal (AM), has no live cells or spores and is proven to enhance the digestive efficiency of the GI tract . Aspergillus fiber contains beta-glucans , fructooligosaccharides (FOS) , chitosan , and mannanoligosaccharides (MOS) . Beta-glucan is considered as a powerful immune-enhancing nutritional supplement that affects the intestinal villi and primes the innate immune system to help the body defend itself against viral and bacterial invaders . MOS protect the GI tract from invading toxins and pathogens by binding toxin active sites . FOS and chitosan refer to a class of non-digestible carbohydrates that are readily fermented by beneficial bacteria in the intestine . A healthy population of these beneficial bacteria in the digestive tract enhances the digestion and absorption of nutrients, detoxification and elimination processes, and helps boost the immune system . With an increase in the dependence on livestock as an important food source, it becomes crucial to achieve good health in order to make rearing of animal food sources safe and beneficial to both animals and humans. Several studies have demonstrated that prevention of Salmonella colonization in chickens can be achieved by feeding prebiotics . According to Lowry et al. , dietary beta-glucan reduces SE colonization significantly in chickens. In their experiment, SE from L/S was recovered from 76% of non-treated birds, while only 7% of the birds were positive for SE in the treated group, (Figure 3). Moreover, in the same study, heterophils isolated from birds treated with dietary beta-glucan contained 40% (p < 0.05) more SE than heterophils isolated from untreated birds, (Table 4). Heterophils form the first line of defense and killing of Salmonella by heterophils is well-described. This corroborates the immunostimulatory effect of beta-glucans and FOS are widely used as prebiotics in a broad range of animal species, and these carbohydrates have been tested with success for protection against Salmonella infections in chickens and other avian pathogens [35, 38, 39]. Kim et al. conducted a study where dietary MOS (0.05%) and FOS (0.25%) had an effect on intestinal microflora of broiler chickens, suggesting the use of these prebiotics as an alternative to the use of growth-promoting antibiotics . Finally, chitosan is a modified, natural biopolymer derived by deacetylation of chitin, the main component of the cell walls of fungi and exoskeletons of arthropods. As mention before, chitosan exhibits numerous beneficial effects, including strong antimicrobial and antioxidative activities. Its application in agriculture, horticulture, environmental science, industry, microbiology, and medicine are well reported . According to Huang et al., the use of 0.01 or 0.015% of oligochitosan in the diet increased serum levels of immunoglobulins in broiler chickens, suggesting a potential immunomodulatory effect . There have been numerous studies that report the use of chitosan as a mucosal adjuvant, by enhancing IgA levels. It is well known that IgA is active across mucosal surfaces and is the predominant class of antibody against enteric pathogens [42, 43]. The commercial prebiotic supplement derived from Aspergillus sp. mycelium is unique because it contains all of the above mentioned prebiotic ingredients. Additionally, AM contains 16% protein and 45% fiber and may be used with low levels of protein and amino acid diets to improve performance in commercial poultry [28, 44]. Even though the exact mechanisms of action for prebiotics have not been defined, it may be speculated that the effect is due to changing intestinal flora that promotes the growth of beneficial bacteria. This product has also been shown to benefit poultry through stimulation of growth, most probably by increasing absorption of feed ingredients and improving digestibility [45, 46]. In a recent study conducted in our laboratory, we evaluated the effect of 0.2% dietary Aspergillus meal (AM) against horizontal transmission of Salmonella spp. in turkeys and chickens . The results of this study showed that dietary supplementation with 0.2% Aspergillus Meal was able to reduce Salmonella enteritidis horizontal transmission in turkeys, (Table 5) and Salmonella Typhimurium horizontal transmission in broiler chickens, by reducing the overall colonization levels in birds, (Table 6). Although the mechanism of action is not totally understood, the reduction in Salmonella colonization may be related to a synergistic effect between beta-glucan, MOS, chitosan, and FOS present in the Aspergillus oryzae mycelium. In a previous work, we showed that dietary AM induces important changes on intestinal morphometry in turkey poults such as increased number of acid mucin cells in the duodenum, neutral mucin cells in the ileum, and sulphomucin cells in the duodenum and ileum, as well as increased villi height and villi surface area of both duodenum and ileum when compared to control, suggesting that AM prebiotic has an impact on the mucosal architecture and goblet cells proliferation in the duodenum and ileum of neonate poults . Our extended studies using dietary AM prebiotic supplemented for 30 days, have shown significantly increased the body weight of neonate poults and improved feed conversion when compared with poults that received the control basal diet, and interestingly, energy and protein content in the ileum was significantly lower in poults that received dietary AM prebiotic compared with control poults suggesting better digestibility, absorption of those nutrients and bone mineralization . FOS have been shown to stimulate calcium (Ca) and magnesium (Mg) absorption in the intestine and increase bone mineral concentrations in humans and rats as well as stimulate net Ca transport from the epithelium of the small and large intestine [30, 38]. The gastrointestinal tract serves as the interface between diet and the metabolic events that sustain life. Intestinal villi, which play a crucial role in digestion and absorption of nutrients, are underdeveloped at hatch and maximum absorption capacity is attained by 10 days of age . Understanding and optimizing the maturation and development of the intestine in poultry will improve feed efficiency, growth and overall health of the bird. Studies on nutrition and metabolism during the early phase of growth in poults may, therefore, help in optimizing nutritional management for maximum growth. By dietary means, it is possible to affect the development of the gut and the competitiveness of both beneficial and harmful bacteria, which can alter not only gut dynamics, but also many physiologic processes due to the end products metabolized by symbiotic gut microflora . Additives such as enzymes, probiotics and prebiotics are now extensively used throughout the world [49–51]. Our studies suggest that the increase in performance and bone parameters in neonatal poults fed with 0.2%AM (Table 7), may be related to a synergistic effect between beta-glucan, MOS, chitosan and FOS from Aspergillus niger mycelium [45, 46]. Mycotoxins are secondary toxic metabolites produced by filamentous fungi which, even at low concentrations, represent an important danger for both animal and human health [52, 53]. Currently, over 300 mycotoxins have been identified worldwide, being aflatoxins, ochratoxins, zearalenone, trichothecenes, and fumonisins, the most frequently found with synergistic toxic effects reported when more than one of these mycotoxins are present in the feed [54, 55]. Mycotoxins are chemically and structurally different, representing serious public health risk factors since mycotoxins have been shown to have carcinogenic, teratogenic, nephrotoxic, and hepatotoxic effects after the consumption of contaminated grains or animal food products . On the other hand, mycotoxins are equally important in the animal food industry, causing significant economic losses due to diminished performance and productivity, decreased reproductive parameters, and an increased mortality rate associated with the toxicological effects in liver, kidneys, and immune system [52, 57, 58]. Researchers have developed some methods in order to reduce the harmful effects of grains contaminated with mycotoxins. These include physical (thermal and irradiation inactivation); chemical (ozonation and ammoniation); and, biological (bacterial degradation or adsorption [57, 59, 60]. Nevertheless, toxin sequestering agents are the most common and reliable products used for the feed industry due to its economic practicality and aptness for nutritional insight [61, 62]. Several studies have demonstrated that cellulosic materials have adsorption capacities for heavy metal ions and other pollutants [63, 64]. Similarly, some researchers have evaluated the binding activity of chitosan (CS) against several mycotoxins [2, 65]. As a biological polymer, chitosan has been shown to have promising uses as an adsorbent for the removal of various mycotoxins, heavy metal ions, and dyes . Furthermore, it has been tested in the removal of OTA from contaminated drinks, demonstrating that chitosan can reduce the levels of this mycotoxin [1, 66]. On the other hand, some in vitro methods have been developed to evaluate the adsorbent capacity of mycotoxin sequestering products [67, 68]. However, these methods may not be directly applicable to poultry diets because they do not use the successive incubation at different pH and enzyme activity conditions similar to the different gastrointestinal compartments of poultry. Recently, we evaluated the adsorption capacity of CS on Aflatoxin B1 (AFB1); Fumonisin B1 (FUB1); Ochratoxin (OTA); Trichothecene (T-2); Deoxynivalenol (DON); and, Zearalenone (ZEA), using an in vitro digestive model that simulates three gastrointestinal compartment of poultry . In that study, deacetylated 95%, high molecular weight (350 kDa) Chitosan (CS, Paragon Specialty Products, LLC, Rainsville, AL, USA) was tested and acetylated with an aqueous solution of acetic acid 1% (v/v). Then, this solution was dropped into NaOH 0.5 M solution and the formed chitosan particles were rinsed three times with pure water and dried [69, 70]. The results showed a moderate adsorbent capacity of CS against five of the six mycotoxins evaluated, except for DON since only 3.5% was adsorbed, (Figure 4). Similar results were obtained in another study using non-crosslinked chitosan against different mycotoxins but it is a fact that cross-linking is related to a higher adsorption capacity and pH can affect it . The mycotoxins adsorption capacity of CS is due to the electrostatic interactions. At alkaline pH, the CS is positively charged, while mycotoxins such as AFB1, FUB1, OTA and ZEA are negatively charged [70–72]. In the case of DON and T-2, the interactions appeared to be minor, causing poor adsorption. These results are very similar to those obtained in other studies . Therefore, it could be said that ionic interactions are the main mechanism of mycotoxin adsorption of chitosan. Another application of chitosan (CS) is its use in nanotechnology for the development of drug delivery systems such as nanoparticles and nanocapsules. These systems emerge as a strategy to improve the dissolution of drugs with low solubility and increase its permeability, which translates into an increase in bioavailability, a greater specificity and also an increase in the stability of drugs against physiological and environmental conditions . In our laboratory, we have developed two nanocapsular systems capable of loading a phytopharmaceutical named Curcumin. This molecule has also been the subject of study in the poultry industry, given its properties, including its antioxidant action, the immunomodulatory, anticoccidial, anti-inflammatory, antimicrobial and growth promotion effects, the latter as an alternative to antibiotic growth promoters in order to maintain the performance and health of the birds [74–76]. In our laboratory, we have already evaluated the antimicrobial activity of curcumin against Salmonella enteritidis in an in vitro model that simulates the three compartments of the chicken gastrointestinal tract. The results obtained show that at a dose of 1%, the concentration of Salmonella enteritidis decreases slightly but not significantly with respect to the control . However, one of the problems of curcumin, even when it is administered at high doses (12 g/day) is its low bioavailability due to its poor solubility and therefore poor absorption, as well as its rapid metabolism and systemic elimination . In this sense, the development of nanocapsular systems aimed to increase the solubility, permeability and stability of curcumin. Such systems were named chitosan nanocapsules (NC-CS) and Alginate nanocapsules (NC-ALG) and were composed of an oily core of vitamin E surrounded by a biodegradable polymeric shell of either chitosan or alginate respectively. Both systems were obtained by the a slightly modification of the solvent displacement technique . However, the formation of NC-CS is based on the electrostatic and hydrophobic interactions as well as the hydrogen bonding and van der Waals forces that take place between the chitosan dissolved in an acidic aqueous phase and the lipid cores of Vitamin E formed in the organic phase, causing the polymer to be adsorbed on the surface of the lipid cores [4, 79–81], (Figure 5(a)). While NC-ALG were prepared using the “Single-stage procedure” based on the dipolar ionic interactions between the polymer (ALG), which is dissolved in the aqueous phase and the cationic sur- factant (CTAB) present in the organic phase which also contains the oil , (Figure 5(b)). The systems were characterized physicochemically in terms of particle size, surface charge, polydispersity index (PDI) and curcumin encapsulation efficiency, (Table 8). Particle size and (PDI) were determined by dynamic light scattering (DLS) using a Malvern Zetasizer Nanoseries 3600 (Worcestershire, UK). The zeta potential values were calculated from the mean electrophoretic mobility values, as determined by Laser Doppler Velocimetry (LDV) using a Malvern Zetasizer Nanoseries 3600 (Worcestershire, UK). The particle size of NC-CS was round 116.7 nm with a PDI of 0.107 and presented positive surface charge (24.4 mV) while NC-ALG was round 178 nm with a PDI of 0.149 and a negative surface charge (−49.0 mV). Curcumin encapsulation efficiency was determined indirectly by Centrifugation-Filtration. Quantification of curcumin was performed by high performance liquid chromatography (HPLC, Merck-Hitachi, Japan) at 425 nm, using a reverse phase Hypersil® Division C8 column (150 × 3 mm, 5 μm; ThermoQuest, Hemel Hempstead, England). Curcumin encapsulation efficiency of both formulations, was >90%, with a final concentration of curcumin around 750 μg/ml [Unpublished work from our laboratory]. The stability to storage conditions is a parameter that must be evaluated in nanoparticulate systems (Table 9). In that study, the storage stability of NC-CS and NC-ALG was around 3 and 2 months respectively. In the case of NC-Cs, after 3 months of storage, the decrease in particle size and the precipitation of CUR were presented with greater magnitude since the chitosan begins to hydrolyze gradually and the viscosity of the formulation based on nanocapsules decreased during the storage period . On the other hand, the results obtained for NC-ALG suggest that the stability of this type of formulation is around 2 months [Unpublished work from our laboratory]. These results are very similar to those reported in other studies, in which they report that the particle size of NC-ALG decreases between month 1 and 5 of storage . An important parameter that was taken into account in these nanosystems was the cellular toxicity on caco-2 cells. For this, the conditions for the maintenance of the cell cultures were made according to Déat-Lainé et al. with slight modifications. Before starting the study, the formulations were diluted in cell culture medium (DMEM: Dulbecco’s Modified Eagle Medium) in order to obtain the treatments with different polymer concentrations. Cell viability was determined by MTT assay . In Figure 6, the results showed that even at high polymer concentrations (500 μg/mL) the cell viability is above 80%. However, it is a fact that the toxicity increases as so does the polymer concentration. Other studies in Caco-2 cells have shown similar results to those obtained in our laboratory and agree that the toxicity of chitosan nanoparticles is due to their physicochemical properties such as size and surface charge and also to the molecular weight of the chitosan and the concentration at which the cells are exposed [87, 88]. In the case of NC-ALG, the toxicity was lower since the interactions between the carboxyl groups of alginate and cell membranes are weaker because they are of the electrostatic type. The toxicity in these systems is more related to the particle size . From the toxicity study, the polymer concentration to carry out the permeability studies was selected. It should be mentioned that this concentration did not compromise cellular viability. Permeability studies were carried out on a monolayer of caco-2 cells and the quantification of curcumin was performed by UPLC-TQ-ESI-MS/MS (Waters ACQUITY UPLC system, Milford, MA, USA). Chromatographic analysis was performed on a Waters ACQUITY BEH Shield RP 18 column (2.1 × 100 mm, 1.7 μm). The polymer concentration used was 500 μg/mL of each polymer. Results show that the permeability of curcumin increased 28.6 and 14.6 times when it was in NC-CS and NC-ALG respectively, compared to the dispersion of curcumin in cell culture medium (DMEM: Dulbecco’s Modified Eagle Medium) [Unpublished work from our laboratory]. The increase in the permeability of curcumin in NC-CS is due to the ability of chitosan to temporarily open the tight junctions, which are related to a decrease in the value of transepithelial electrical resistance (TEER, MERSSTX01 electrode, Millicell ERS-2, Millipore, Billerica, MA, USA) (Table 10). The mechanism by which chitosan has this capacity is based on the interaction of its protonated amino groups with cell membranes, followed by a reversible structural reorganization of the binding proteins and a specific redistribution of the actin F cytoskeleton and the ZO-1 protein [90, 91]. Furthermore, it has been reported that particles positively charged, with spherical shape and with a monodisperse population have improved cellular uptake through the caveolae-mediated endocytosis and macropinocytosis pathway [65, 92]. Meanwhile, the mechanism of passage of NC-ALG through the monolayer of caco-2 cells depends largely on the particle size mainly. So, the main mechanisms are endocytic such as clathrin-mediated endocytosis, caveolae-mediated endocytosis and micropinocytosis [92, 93]. The results suggest that the use of NC-CS and NC-ALG to improve the bioavailability of curcumin is an interesting strategy to enhance the antimicrobial effect. Previous studies using an in vitro digestive model that simulates three gastrointestinal compartments of poultry have demonstrated that raw curcumin does not have good antimicrobial activity against Salmonella enteritidis . However, when a solid dispersion of curcumin/PVP K30 was used, it decreased the concentration of Salmonella enteritidis more than 3 log in the compartment that simulates the intestine [Unpublished work from our laboratory]. Additional in vivo studies in 1-day-old chickens challenged with 104 CFU of Salmonella enteritidis/bird has shown that the solid dispersion of curcumin/PVP K30 administered in the feed at a concentration of 0.1% decreased more than 2 log the concentration of Salmonella enteritidis in ceca-cecal tonsil isolates [Unpublished work from our laboratory]. Since nanocapsules increased the solubility and permeability of curcumin, the antimicrobial activity of nanocapsules loaded with curcumin developed in our laboratory is being carried out both in vitro and in vivo against Salmonella enteritidis. As seen in this chapter, chitin and its derivatives, such as chitosan, are biopolymers with a wide variety of applications in different areas. Chitosan as a functional biopolymer has different properties. Some of these properties are its intrinsic nutritional value, such as antioxidant properties and health-promoting bioactivities against many chronic diseases, including hypercholesterolemia, hypertension, inflammation and immune diseases. In the case of chitin, its application is more limited given its poor solubility in aqueous medium, however, it has been reported that it has practically the same properties as its derivatives. Every year millions of people are affected and thousands of them die due to infections and intoxication as a result of foodborne outbreaks, which also cause billions of dollars’ worth of damage, public health problems and agricultural product loss. A considerable portion of these outbreaks is related to the consumption of contaminated products with foodborne pathogens and mycotoxins. In this sense, one of the main applications of chitosan is its antimicrobial effect against Gram-positive bacteria such as Gram-negative bacteria, having better activity with the latter due to the ionic interaction that takes place between the positively charged chitosan molecules and the negatively charged microbial cell membranes. Studies conducted on chickens and turkeys challenged with Salmonella enteritidis and typhimurium show the antimicrobial capacity of chitosan when it is administered in the feed. Furthermore, in vitro studies have demonstrated its properties as an adsorbent, since it can interact ionically with mycotoxins such as AFB1, FUB1, OTA and ZEA given that they are negatively charged, nevertheless, it is a fact that cross-linking is related to a higher adsorption capacity. Finally, another application of chitosan is its use in nanotechnology for the development of nanoparticles and nanocapsules. These systems are an important strategy to improve the solubility, permeability and stability of molecules that are difficult to formulate. In the case of curcumin, a phytopharmaceutical that has become the subject of study in the poultry industry given its properties, including its antioxidant action, the immunomodulatory, anticoccidial, anti-inflammatory, antimicrobial and growth promotion effects, has problems of solubility and permeability, which causes low bioavailability. However, its association or encapsulation in nanoparticulate systems has shown that the solubility and permeability of this are improved. This suggests that the use of curcumin loaded in chitosan nanocapsules could increase its antimicrobial activity derived from the combination of the effects between chitosan and curcumin on different bacteria. This research was supported by the Arkansas Bioscience Institute under the project: Development of an avian model for evaluation early enteric microbial colonization on the gastrointestinal tract and immune function. The authors thank the CONACyT for the doctoral scholarship number 447447 and the financial support obtained through the program PAPIIT IN218115 of DGAPA-UNAM. This article was originally published in Chitin-Chitosan, Chapter 13, Chitoneous Materials for Control of Foodborne Pathogens and Mycotoxins in Poultry. http://dx.doi.org/10.5772/intechopen.76041. This chapter is distributed under the terms of the Creative Commons Attribution License (http://creativecommons.org/licenses/by/3.0).